I'm going to call this my master piece (personallu, not over all of all wallpapers haha). This took me about two months off and on to make, so it was a lot of work. Not to mention the original image was tiny (in comparison to the end wallpaper size). But I loved the image and I really wanted to vector it all and make it my first wallpaper-vector! ^-^ I'm so happy to finally see it happen. 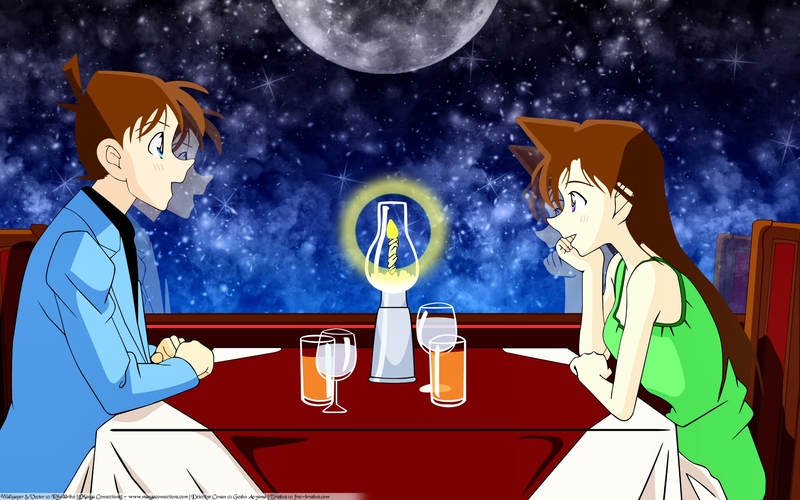 I started out with vectoring Shinichi, Ran, and the table. I ignored the background, ignored the chairs and wall and window and even the reflection. Focused on them. Once they were done, the rest was just a matter of actually getting it done! I threw in a lot of stars using a brush (I'll credit when my parents aren't hounding me to go to bed and I have time to actually look up which site I got it from. Be patient till then! But I will credit the single not-mine-brush!) and I made it cloudy-ish using a brush that came with the program (Program credit goes to Paint-Shop-Pro 8). Besides those two brushes, the rest was all vectoring. Their eyes. I'm in love with doing the eyes like that! I actually used manga versions for their eyes because it had more character, depth, and looked prettier (haha). The original eyes were just too plain, and the these eyes light up their faces. Obviously the background in the window changed from city to stars (if you want to think realistically, just imagine they're farther up). There are no place mats or silverware (I thought they kind of added too much cluster to the feelings I wanted and they were hard to make look good at they're newer-bigger size). Changed some colors such as the chair and wall went from blue to shades or red (thought it was more fitting to the table being red and the "romantic" feeling). Didn't put the straws in (yea... that just didn't go with my idea of an upper class lovey-dovey dinner). Lastly I didn't put the little pointy thing on the chairs... just because I personally was struggling with it not looking "off". I'm not familiar with the series at all but I do like what you've done with this wallpaper. For starters the characters are clearly defined with vibrant yet soothing colors. 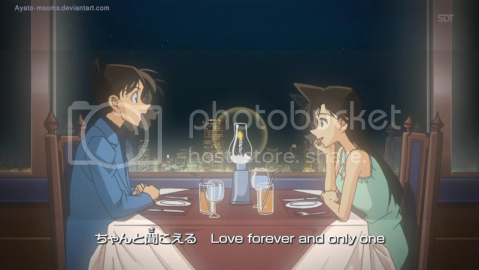 Love the scenery and their romantic atmosphere, I think you put a nice spin on it. Good work!